I recently had the opportunity to travel to New York City for an international conference on mathematics education. I knew that Shihan Gorai had a dojo in New York City, so I looked up the location and as it turned out is was only one mile from the hotel where I was staying. I inquired with my instructor Sensei Tom about the possibility of training at the NYC dojo during my visit, he then contacted Shihan Stuart, who was happy to make the arrangements with Shihan Gorai. 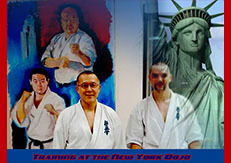 I left Vancouver excited not only about my conference, but also about the opportunity to train at the NYC dojo. On Friday, November 22, 2013, after two days of speakers and presentations on math education, I arrived at the NYC dojo ready for a hard evening of training. Shihan Gorai instructed the class from 6:00 - 7:30 pm, the training was fast paced and fun! We began the class with basics, the first thing I noticed was that the students did not reply OSU when given instructions as to which technique was to be performed, but rather they repeated the instructions. I feel that this is a good way of reinforcing terminology and I have decided to take this new strategy back to the Newton dojo. This simple difference also made me very aware of how I automatically OSU, without thinking, after instructions are given. The second half of the class was dedicated to fight training. Shihan Gorai really made me think about my footwork and multiple ways to put together combinations that attack the inside and outside of the legs. My very talented sparring partner, a brown belt named Damien, made me realise how I need to work on blocking inside leg kicks. I have provided some nice photo evidence of this! After class was finished, Shihan Gorai was kind enough to answer some questions that I had about the Tonfa Kata. The overall experience of training at the NYC dojo was amazing and I would recommend to anyone who is travelling to take the opportunity to train at a local dojo, if one is available. This entry was posted	on Monday, December 2nd, 2013 at 9:38 pm	and is filed under Uncategorized. You can follow any responses to this entry through the RSS 2.0 feed. Both comments and pings are currently closed.